Wilma Waterson, Co Chairperson and Elaine Anderson Co Chairperson of Breakthrough Oldmeldrum Fundraising Group with the Supporter Wall. AN Oldmeldrum woman has been honoured by charity Breakthrough Breast Cancer. The Supporter Wall recognises individuals and organisations who have each raised over £1,000 for Breakthrough Breast Cancer, the UK’s leading research charity dedicated to stopping women dying from breast cancer. Supporters are invited to nominate a name to appear on the wall with many people choosing to pay tribute to loved ones that have survived or died from breast cancer. This year, there are almost 100 names listed on the wall which is displayed in the charity’s Scottish office, in Edinburgh. Anne Geach founded the Breakthrough Oldmeldrum Fundraising Group 16 years ago but has recently decided to step down as Chairperson. The Aberdeenshire group has raised over £150,000 for Breakthrough Breast Cancer through a series of events including a hoedown, lingerie evenings, coffee mornings, bake-offs, and a summer food festival. 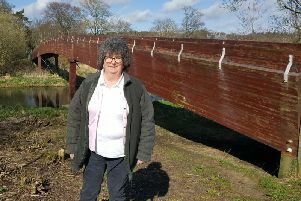 Elaine Anderson, Chairperson of Breakthrough Oldmeldrum Fundraising Group and her committee decided to include Anne’s name on the Supporter Wall as tribute to her fundraising efforts over the years. Elaine comments: “It was a very special moment when I saw Anne’s name unveiled on the Supporter Wall. It’s a really nice way to acknowledge her fundraising achievements. “Breast Cancer continues to have a huge impact on the lives of so many people and it’s quite inspirational to see the list of names, all of whom have been affected by the disease in some way. James Jopling, Director for Scotland at Breakthrough Breast Cancer said: “We are incredibly grateful to supporters like Anne and the Breakthrough Oldmeldrum Fundraising Group who do incredible things to fundraise for us.